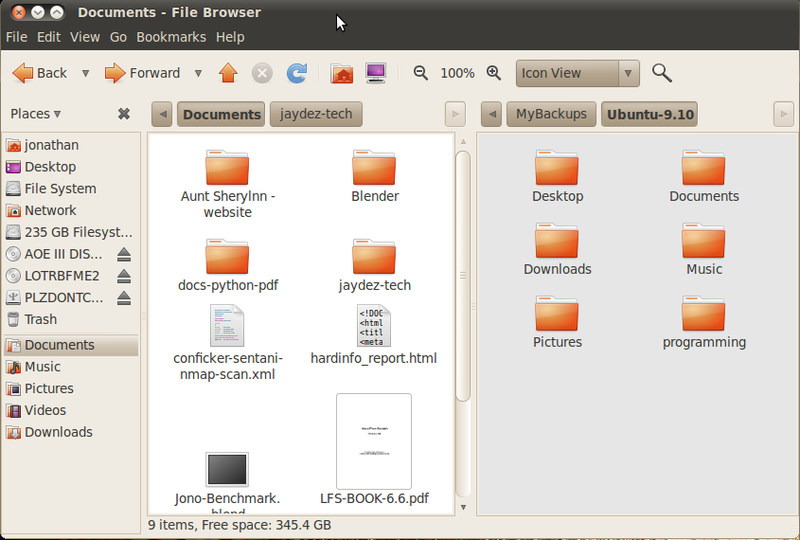 Well, I just installed Ubuntu 10.04, nicknamed "Lucid Lynx", and it definitely looks very lucid. I didn't even know what that word meant until I looked it up in the dictionary that accompanies 10.04, something very useful. The first thing I did after finishing the installation was reboot and login (obviously). Next I added the System Monitor to my top panel. Since I do lots of resource heavy tasks, I like to have a quick view of what I'm using. In case you are new to Linux--to do this just right click the top panel and select add to panel..., then scroll down and click on System Monitor. Done! Next I went to restore my backed up data from Ubuntu 9.10. Unfortunately Maxtor encrypted drives do not work on Linux, so I had to boot to Windows XP (Luckily I have dual-booted) and unlock the drive. From there I restarted (DO NOT SHUTDOWN!) and logged back in to Linux. Once that was done I had access to all my data, it was a bit of a hassle, but not something that Ubuntu could do anything about. I double clicked on the icon of my external HDD on the desktop and waited for it to load.Nothing happened, so I double clicked again and voila, it worked. A little weird but at least I could get around it. Then I noticed the first major difference about Ubuntu. The minimize/maximize/exit buttons have been moved from the right side to the left, imitating a mac book. I'm still getting used to it, and I don't really see the point of the switch, however it is not going to kill my usage of Ubuntu. If you are really tired of using it however, you can change the theme. Luckily for every drawback there seems to be an advantage to Lucid Lynx. When I went to copy my files from the HDD to my home folders, I was able to use the much talked about new feature for 10.04, the split screen file browser. To activate it just press the f3 key or select view>extra pane. I copied my desktop first, no problems, however when I got to copying my documents Nautilus (the file browser) froze up. I opened my documents again, and it stopped being frozen (weird how these things work). I tried it again, and it worked partially, however it said it couldn't copy some files which is weird because I had copied them fine before. Some of the files were copied but had errors, while others worked fine. I went back and deleted all the ones with errors, and tried to copy them again. Nautilus kept freezing up so finally I just closed the window and opened up two new ones, thinking it might have been a problem with the split screen. However opening up my HDD was taking forever. I tried a couple times, but it just didn't want to open, so I shutdown the computer, started windows, unlocked the drive, restarted into Linux, and tried again. Now that I had rebooted Nautilus was working much faster, however that weird bug of having to double click twice to open my HDD showed itself again. Luckily I was able to get into it this time at least. I didn't try the split screen, instead I just reverted to the old two windows. I copied my music folders over fine (no problems this time! ), and my photos went over like lightning. The same thing happened with my downloads folder and later when I tried to recopy my “files with errors” everything went fine (no errors either). Next I copied my programming folder, which took a fair bit longer because of the amount of stuff in it! I went away while I waited for the folder to copy and coming back was presented with a black screen. Realizing that this was my boring screen saver I decided the next thing to do was to change the screen saver. System>Preferences>Screensaver and I was at the right dialogue. I skipped the Fiberlamp and Floating Ubuntu and went straight for the GLMatrix screensaver, the same one I'd had in 9.10. Although there were a couple new screensavers, none really captured my interest. Next, while I was on the topic of looks I changed my background from the default purple blur to a cool tree—named Bosque TK for some reason. . It was as simple as right clicking on the desktop and selecting Change Desktop Background. The new backgrounds were very cool for the most part, I especially like the SmoothMoment and Icy Stone 2. I would have liked it if there had been less flower pictures however, if you don't like the selection, you can take your own or Get more backgrounds online—going online gives you a fairly decent selection as well. The next couple things to do were get drivers, download the restricted extras package (which lets you read mp3s, and watch most DVDs. However since I couldn't get online at that moment I settled for setting up my Rythmbox library. A quick Applications>Sound & Video>Rythmbox Music Player started it up and I went to begin importing my library. I found that Rythmbox was so efficient it had already imported it all, except for the mp3 files, which it told me I needed a special plug-in for. While I waited I decided to explore some of the other features of Ubuntu. The games section (Applications>Games) had been sifted through significantly since 9.10 and now sported only 5 games (good picks too in my opinion), instead of the 15 or so that Karmic Koala had. 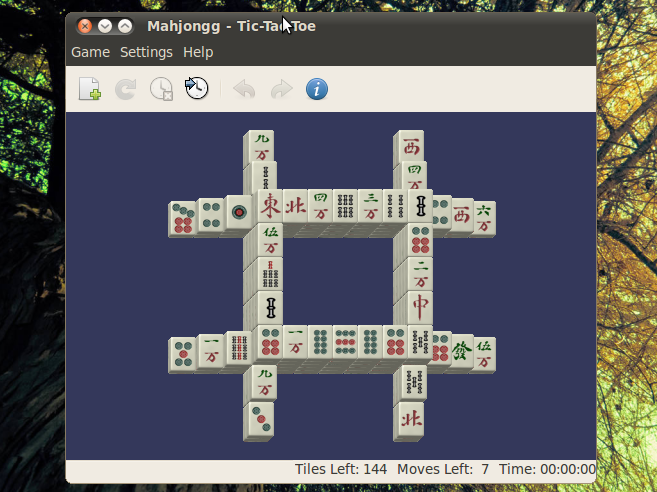 Those games are: AisleRiot Solitaire: a collection of various card games (more than 75—this is one place I think that Ubuntu could cut down on games as well). Gbrainy: a brain game(how surprising!) which has 4 different categories to test yourself on. The biggest problem with this one is the way you answer it, you have to type in the answers yourself. This caused me some problems the first time I did it, when I was expecting to have to click the answer. However you will eventually get used to it (like most things). 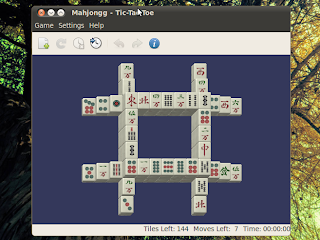 Mahjong: A nice game of matching tiles. This one works pretty well, however the look of it doesn't match the lucid nature of the rest of 10.04. This game definitely needs an improvement in graphics before the next Ubuntu release! Mines: The same game we know and love from windows and previous Ubuntu distros, select all the tiles except those with mines underneath. Again, although everything looks awesome at normal size, the mines and explosions don't really hold up when you're playing at fullscreen. Although I doubt it will be played that much at full screen it's best to be prepared for everything. Quadrapassel: The gnome version of Tetris, this game is very familiar, however the game play (at least on my computer) is very glitchy, and it isn't very clear what size the steps are. I think that the blocks should be textured (instead of just being a solid colour), and that gameplay should be cleaner, but for die hard fans this game is still playable. Sudoku: Seems to be the exact same game as I played in Karmic Koala, but that doesn't mean it isn't still great! No crits about this one, looks pretty good and plays pretty good (however, I might be a little biased). I finally had managed to connect to the Internet, and I was ready to begin the next step. I had a list of things to download, and they were all fairly big, so I figured it might take a while. First I had to install my needed drivers and the restricted extras package. I also needed to update my system. Later I had to install various programs such as the GNU C++ compiler, CodeBlocks IDE (What I use for my C++ coding), Blender, Scons, SVN, Mercurial, various development libraries, GIMP (It's no longer included in Ubuntu), Inkscape, MuseScore and so many other programs it wasn't even funny. However, I seemed to have gotten through the major part of setting up and playing with Ubuntu, and getting those programs installed was as easy as starting the Ubuntu Software Center (Applications>Ubuntu Software Center) and searching for all the programs I wanted. 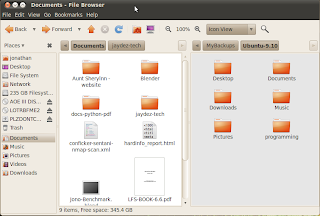 Hope you enjoyed this review/experience of setting up Ubuntu 10.04 “Lucid Lynx” and giving it a test drive. I am definitely enjoying this new distro from Canonical and am finding many of the reasons for my previous doubts have actually been fixed. Specifically when I tested the F-Spot photo manager, I found that it actually was pretty easy to change between edit mode and viewer mode. I am looking forward to to Ubuntu 10.10 which should be another great improvement! Note: I used 10.04 to take and edit the photos included.